Follow instructions on Betty Crocker cookie mix. 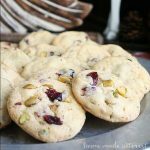 Add pistachios, dried cranberries, and white chocolate chips. Roll dough into 1 inch balls and place 3-4 inches apart on an ungreased cookie sheet.